Varenicline, a new nicotinic ligand based on the structure of cytisine, has recently been approved by the U.S. Food and Drug Administration for use as a smoking cessation aid. Varenicline has been shown to be a partial agonist of α4β2 receptors, and in equilibrium binding assays, it is highly selective for the α4β2 receptor. In this study, we have examined the functional activity of varenicline at a variety of rat neuronal nicotinic receptors expressed in Xenopus laevis oocytes and assayed under two-electrode voltage clamp. We also find that varenicline is a potent, partial agonist at α4β2 receptors, with an EC50 of 2.3 ± 0.3 μM and an efficacy (relative to acetylcholine) of 13.4 ± 0.4%. Varenicline has lower potency and higher efficacy at α3β4 receptors, with an EC50 of 55 ± 8 μM and an efficacy of 75 ± 6%. Varenicline also seems to be a weak partial agonist at α3β2 and α6-containing receptors, with an efficacy <10%. It is remarkable that varenicline is a potent, full agonist at α7 receptors with an EC50 of 18 ± 6 μM and an efficacy of 93 ± 7% (relative to acetylcholine). Thus, whereas varenicline is a partial agonist at some heteromeric neuronal nicotinic receptors, it is a full agonist at the homomeric α7 receptor. Some combination of these actions may be involved in the mechanism of varenicline as a smoking cessation aid. Neuronal nicotinic acetylcholine receptors (nAChRs) are ligand-gated ion channels composed of α and β subunits that assemble to form pentamers with a variety of pharmacological and biophysical properties (Corringer et al., 2000). These receptors are widely distributed in the CNS and have been proposed as potential therapeutic targets for a variety of conditions and disorders, such as Alzheimer's disease, anxiety, depression, drug addiction, epilepsy, pain, Parkinson's disease, schizophrenia and Tourette's syndrome (Jensen et al., 2005). The development of subtype selective ligands is an essential part of attempts to make progress in these areas. Therefore, much effort is currently directed toward synthesizing and screening analogs of various nicotinic compounds (recently reviewed in Jensen et al., 2005). The α4β2 nAChR (and more complex α4β2-containing receptors) is a target of particular interest for the development of smoking cessation therapies because of the location of this receptor on presynaptic terminals in the striatum and the role of this receptor in modulating dopamine release (Salminen et al., 2004). Cytisine is a plant alkaloid with a relatively rigid conformation. In equilibrium binding assays, cytisine is selective for the α4β2 subunit combination, compared with other important nAChR subtypes such as α3β4 and α7 (Parker et al., 1998; Stauderman et al., 1998; Chavez-Noriega et al., 2000; Carbonnelle et al., 2003; Slater et al., 2003; Xiao et al., 2004). In functional assays, cytisine shows greater potency at α4β2 receptors than at many other subunit combinations. Cytisine also displays a wide variation in efficacy at various subunit combinations. Although cytisine is a high-efficacy agonist at α7 receptors and at various β4-containing receptors, such as α3β4, cytisine is a low-efficacy partial agonist at α4β2 and other β2 containing receptors (Luetje and Patrick, 1991; Papke and Heinemann, 1994; Chavez-Noriega et al., 1997; Stauderman et al., 1998; Chavez-Noriega et al., 2000; Papke and Porter Papke, 2002; Carbonnelle et al., 2003; Slater et al., 2003). Manipulation of the cytisine structure results in changes in the efficacy at various neuronal nAChRs. For example, bromination or iodination of the 3-position in the pyridone ring of cytisine preserves the full efficacy at α7 receptors and increases the efficacy at α4β2 receptors (Slater et al., 2003), whereas the addition of side groups at the basic nitrogen of cytisine can reduce or eliminate efficacy for various receptors (Carbonnelle et al., 2003). Varenicline is a recently developed nicotinic ligand that has recently been approved by the U.S. Food and Drug Administration for use as a smoking cessation therapy (Coe et al., 2005a, b, c; Obach et al., 2006). The structure of varenicline (Fig. 1) is loosely based on that of cytisine and it was the partial agonist activity of cytisine that was one of the initial characteristics that led to the development of varenicline (Coe et al., 2005a, b, c). In equilibrium binding assays, varenicline is selective for the α4β2 receptor compared with α3β4, α7, and muscle-like nAChRs, whereas in a functional assay, varenicline is a partial agonist at α4β2 receptors (Coe et al., 2005a). In this study, we examined the functional potency and efficacy of varenicline at several neuronal nAChR subunit combinations. We found that varenicline displayed only moderate differences in functional potency but showed wide variation in efficacy at these receptors. Materials.Xenopus laevis frogs were purchased from Nasco (Ft. Atkinson, WI). Care and use of X. laevis frogs in this study were approved by the University of Miami Animal Research Committee and meet the guidelines of the National Institutes of Health. RNA transcription kits were from Ambion (Austin, TX). All other chemicals were from Sigma-Aldrich (St. Louis, MO). Varenicline. 6,7,8,9-Tetrahydro-6,10-methano-6H pyrazino[2,3-h]benzazepine (varenicline) was synthesized as the dihydrochloride salt using reported methods (Coe and Brooks, 2002; Brooks et al., 2004). We thank Dr. Jotham Coe for helpful suggestions. The structure of varenicline is shown in Fig. 1. Expression of Neuronal nAChRs in X. laevis Oocytes. Mature X. laevis frogs were anesthetized by submersion in 0.1% 3-aminobenzoic acid ethyl ester. Oocytes were surgically removed, and follicle cells were removed by treatment with collagenase B for 2 h at room temperature. cRNA encoding the rat α3, α4, α6/α3 (see below), α7, β2, β3, and β4 neuronal nAChR subunits was synthesized using mMessage mMachine kits (Ambion). Oocytes were injected with 10 to 40 ng of cRNA in 13 to 50 nl of water and incubated at 19°C in modified Barth's saline [88 mM NaCl, 1 mM KCl, 2.4 mM NaHCO3, 0.3 mM Ca(NO3)2 0.41 mM CaCl2, 0.82 mM MgSO4, 100 μg/ml gentamicin, 15 mM HEPES, pH 7.6] for 2 to 6 days. For heteromeric nAChRs, cRNA transcripts encoding each subunit were injected into oocytes at a molar ratio of 1:1. Neuronal nAChRs containing the α6 subunit are narrowly distributed, but functionally important, in the mammalian central nervous system (Salminen et al., 2004). Unfortunately, receptors containing this subunit are difficult to functionally express. However a successful strategy has been to use a chimeric subunit consisting of the N-terminal extracellular domain of α6 joined to the transmembrane and intracellular domains of α3 (Kuryatov et al., 2000; McIntosh et al., 2004; Azam et al., 2005). This chimeric α6/α3 subunit was kindly provided by Dr. Michael McIntosh (University of Utah). In accordance with previous reports (McIntosh et al., 2004), we found that whereas functional expression of the α6/α3 chimera with the β2 subunit was very weak, useful levels of functional expression could be achieved with the inclusion of the β3 subunit. Indeed, α6β2β3is a functional nAChR subtype in the mammalian central nervous system (Salminen et al., 2004). Electrophysiological Methods. Agonist-induced current responses were measured 2 to 6 days after cRNA injection using two-electrode voltage clamp in an automated parallel electrophysiology system (OpusExpress 6000A; Molecular Devices, Sunnyvale, CA). Micropipettes were filled with 3 M KCl and had resistances of 0.2 to 2.0 MΩ. Current responses were recorded at a holding potential of -40 mV to minimize the contribution of calcium activated chloride channels. For all receptors except α7, current responses were filtered (four-pole, Bessel, low-pass) at 20 Hz (-3 db) and sampled at 100 Hz. For α7 receptors, current responses were filtered (four-pole, Bessel, low-pass) at 100 Hz (-3 db) and sampled at 500 Hz. Current responses were captured and stored using OpusXpress 1.1 software (Molecular Devices). Initial analysis was done using Clampfit 9.1 software (Molecular Devices). Oocytes were perfused at room temperature (20-25°C) with Ringer's saline (115 mM NaCl, 1.8 mM CaCl2, 2.5 mM KCl, 0.0001 mM atropine, and 10 mM HEPES, pH 7.2). For all receptors except α7, acetylcholine and varenicline were applied for 20 s at a flow rate of 4 ml/min, with 3-min washes between applications. For α7 receptors, acetylcholine and varenicline were applied for 5 s at a flow rate of 4 ml/min, with 3-min washes between applications. The acetylcholine concentration, applied before each varenicline application, was 20 μM for α4β2 (EC30), 110 μM for α3β4 (EC20), 10 μM for α3β2 (EC20), 30 μM for α6/α3β2β3 (∼EC50), and 300 μM for α7 (EC50). 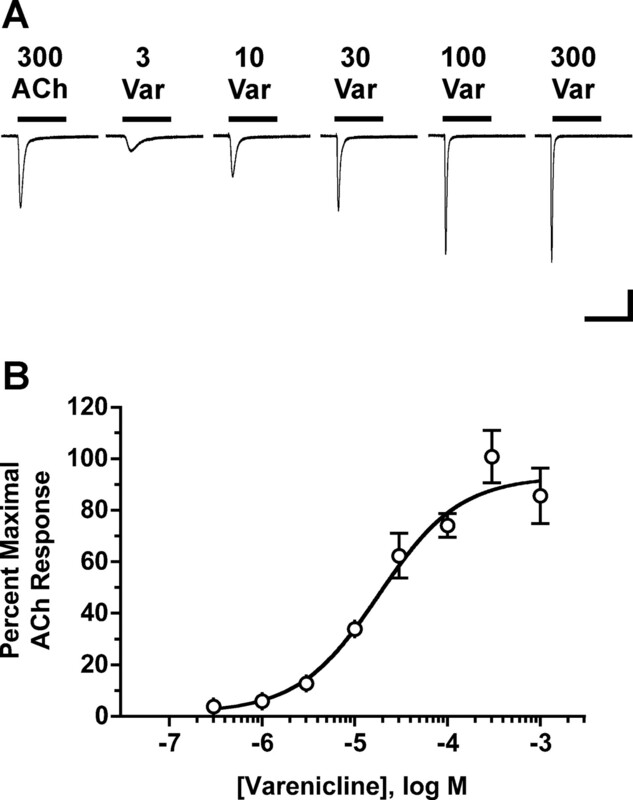 Each current response to varenicline was normalized to the preceding acetylcholine-induced response. Dose response data were fit to the equation I = Imax/[1 + (EC50/X)nH], where I is the current response at agonist concentration (X), Imax is the maximum current, EC50 is the ligand concentration producing the half-maximal current response, and nH is the Hill coefficient. Dose response data for inhibition curves were fit to the equation I = Imax/[1 + (X/IC50)nH], where I is the current response at agonist concentration (X), Imax is the maximum current, IC50 is the ligand concentration producing half-maximal inhibition of the current response, and nH is the Hill coefficient. We first examined the effect of varenicline on rat α4β2 receptors expressed in X. laevis oocytes. Application of 100 μM varenicline yielded a peak current response that was smaller in amplitude than the response evoked by 20 μM ACh (the EC30 for ACh), suggesting that varenicline might have a low efficacy at this receptor (Fig. 2B). The response to this high concentration of varenicline desensitized rapidly compared with the response to a low concentration of varenicline (1 μM, Fig. 2A). The small deflection seen when the varenicline is washed away suggests that in addition to the desensitizing effect, varenicline may cause a small amount of channel block. When the α4β2 receptor was challenged with a range of varenicline concentrations and the current responses were normalized to the maximal response to ACh (see Materials and Methods), we found that varenicline was a potent (EC50 = 2.3 ± 0.3 μM) partial agonist with an efficacy 13.3 ± 0.4% that of ACh (Fig. 2C). These results are similar to what has been previously reported for human α4β2 (EC50 = 2.3 μM, efficacy = 24% relative to nicotine; Coe et al., 2005a). When a range of varenicline concentrations were coapplied with ACh (40 μM, the EC60), we found that varenicline can antagonize the ACh response with an IC50 of 0.2 ± 0.03 μM (Fig. 2D), consistent with the idea that varenicline is a potent partial agonist of α4β2 receptors. Action of varenicline at α4β2 receptors. A, current responses of an oocyte expressing α4β2 receptors to 20 μM ACh and 1 μM varenicline. Scale: 200 nA, 20 s. B, current responses of an oocyte expressing α4β2 receptors to 20 μM ACh and 100 μM varenicline. Scale: 200 nA, 20 s. C, responses of α4β2 expressing oocytes to a range of varenicline concentrations, normalized to the maximal ACh response. Values are the mean ± S.E.M., n = 5. 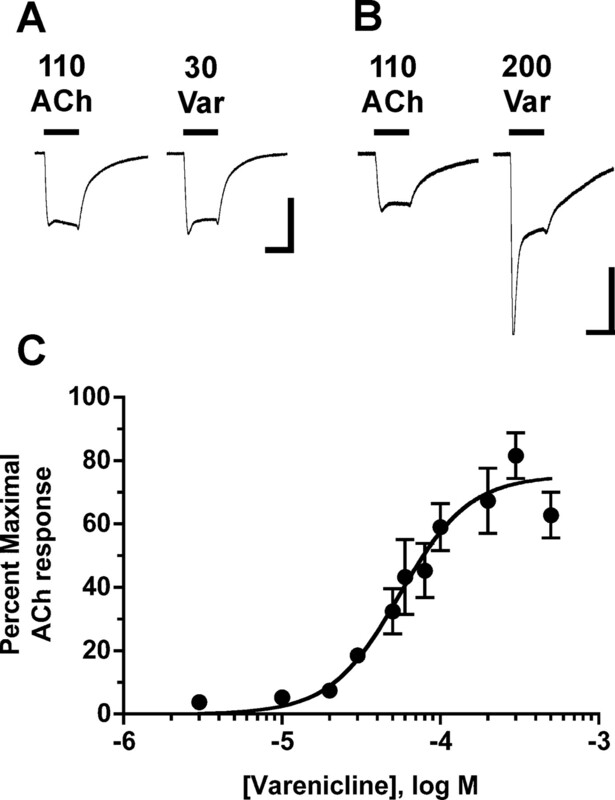 D, varenicline inhibition of ACh responses. Responses of oocytes to 40 μM ACh (EC60) combined with various concentrations of varenicline are normalized to the response to ACh alone. Values are the mean ± S.E.M., n = 4to5. Action of varenicline at α3β4 receptors. A, current responses of an oocyte expressing α3β4 receptors to 110 μM ACh and 30 μM varenicline. Scale: 0.5 μA, 20 s. B, current responses of an oocyte expressing α3β4 receptors to 110 μM ACh and 200 μM varenicline. Scale: 0.5 μA, 20 s. C, responses of α3β4 expressing oocytes to a range of varenicline concentrations, normalized to the maximal ACh response. Values are the mean ± S.E.M., n = 4to10. Next, we examined the action of varenicline on other neuronal nAChR subtypes. Application of 200 μM varenicline to an oocyte expressing α3β4 receptors yielded a peak current response with an amplitude substantially larger than the response evoked by 110 μM ACh (the EC20 for ACh), suggesting that varenicline might have a high efficacy at this receptor (Fig. 3B). The response to this high concentration of varenicline desensitized rapidly, compared with the response to a lower concentration of varenicline (30 μM, Fig. 3A). The small deflection seen when the varenicline is washed away suggests that in addition to the desensitizing effect, varenicline may cause a small amount of channel block. When the α3β4 receptor was challenged with a range of varenicline concentrations and the current responses normalized to the maximal response to ACh (see Materials and Methods), we found that varenicline had an efficacy of 75 ± 6% at these receptors (Fig. 3C). Varenicline was 24-fold less potent at α3β4 receptors (EC50 = 55 ± 8 μM) than at α4β2 receptors. We also examined the efficacy of varenicline at α3β2 receptors and α6-containing receptors (as represented by an α6/α3 chimera coexpressed with the β2 and β3 subunits, see Materials and Methods). When 100 μM varenicline was applied to oocytes expressing α3β2 receptors, current responses were 3.7 ± 0.4% of the maximal ACh response. This was a saturating response, in that 1 mM varenicline did not yield larger current responses (data not shown). Thus, varenicline is a low-efficacy partial agonist at α3β2 receptors, with an EC50 < 100 μM. Varenicline also displayed low efficacy on the α6/α3β2β3 receptor, with 100 μM varenicline yielding responses that were 8.8 ± 1.4% of the maximal response to ACh. Again, this seems to be a saturating response, because the response to 10 μM varenicline was similar (data not shown). Although varenicline proved to be a partial agonist at many of the neuronal nAChR subtypes that we tested, the effect of varenicline was remarkably different at α7 containing receptors. When 100 μM varenicline was applied to α7 expressing oocytes, peak current responses were substantially larger than the responses to 300 μM ACh (the EC50), suggesting that varenicline has high efficacy at these receptors (Fig. 4A). This was borne out when we applied a range of varenicline concentrations to α7-expressing oocytes. Varenicline was a potent full agonist, activating α7 receptors with an EC50 of 18 ± 6 μM and an efficacy that was 93 ± 7% of the maximal response to ACh (Fig. 4, A and B). The rapid desensitization kinetics of the α7 receptor at all agonist concentrations has raised concerns about the use peak current measurements to study the α7 receptor and an alternate method, net charge analysis, has been proposed (Papke and Porter Papke, 2002). When using net charge analysis, the EC50 for ACh is greatly reduced and 300 μM ACh becomes a saturating concentration (Papke and Porter Papke, 2002). When we examine the actions of varenicline on α7 receptors using net charge analysis, we again find that varenicline is a potent, high efficacy agonist, with an EC50 of 2.3 ± 0.2 μM and an efficacy of 84 ± 2%. Action of varenicline at α7 receptors. A, current responses of an oocyte expressing α7 receptors to 300 μM ACh and various concentrations of varenicline (in μM). Scale: 1 μA, 5 s. B, responses of α7 expressing oocytes to a range of varenicline concentrations, normalized to the maximal ACh response. Values are the mean ± S.E.M., n = 5to11. We find relatively modest differences in the functional potency of varenicline at several neuronal nAChRs. The EC50 for varenicline activation of α4β2is2.3 ± 0.3 μM, whereas varenicline was 8- and 24-fold less potent at α7 and α3β4 receptors, respectively. These results contrast with the high degree of selectivity reported for varenicline at α4β2 compared with α7 and α3β4 receptors (Coe et al., 2005a). However, in this earlier study, it is the equilibrium binding affinity of varenicline that is being compared. In this context, varenicline is highly selective for α4β2, displaying an affinity that is 4000- and >5000-fold greater than the affinities for the α3β4 and α7 subtypes, respectively. The binding affinity derived from this type of assay is primarily the affinity of the ligand for the desensitized state(s) of the receptor. Unfortunately, large differences in affinity observed in equilibrium binding assays are generally not observed in functional assays, and the rank order of affinities do not necessarily correlate with the rank orders of functional potency or efficacy (Avalos et al., 2002; Jensen et al., 2005). Thus, we find that the functional potency of varenicline at α4β2, α3β4, and α7 receptors varies by 24-fold or less. More interesting is the variation in efficacy, which ranges from low (<15% for α4β2, α3β2, and α6-containing receptors), to high (93% and 75% for α7 and α3β4 receptors, respectively). This variation in efficacy is not surprising considering that the initial inspiration for the development of varenicline was cytisine (Coe et al., 2005a), an agonist that displays low efficacy at α4β2 receptors and high efficacy at α3β4 and α7 receptors (Luetje and Patrick, 1991; Papke and Heinemann, 1994; Chavez-Noriega et al., 1997, 2000; Stauderman et al., 1998; Papke and Porter Papke, 2002; Carbonnelle et al., 2003; Slater et al., 2003). Compared with cytisine, varenicline has a similarly low efficacy at α4β2 and other β2-containing receptors and a similarly high efficacy at α3β4 and α7 receptors. We have characterized the pharmacological properties of varenicline using rat neuronal nAChRs. Thus, it is important to consider how our results may relate to the actions of varenicline at human receptors. As discussed above, varenicline displays similar potency and efficacy values at both rat and human α4β2 receptors (Table 1) (Coe et al., 2005a). In addition, cytisine displays similar potencies and efficacies on both rat and human α4β2, α3β4, and α7 receptors (Chavez-Noriega et al., 1997; Papke and Porter Papke, 2002; Carbonnelle et al., 2003). Thus, the actions of varenicline on rat neuronal nAChRs that we describe here are likely to be relevant to the actions of varenicline on human receptors. EC50 values were determined from the fit data in Figs. 2C, 3C, and 4B. Efficacy values are presented as the percentage of maximum ACh response (see Materials and Methods). Efficacy values for α4β2, α3β4, and α7 are taken from the fit data in Figs. 2C, 3C, and 4B, respectively. Efficacy values for α3β2 and α6/α3β2β3 are derived from a single concentration of varenicline (100 μM). All values are presented as mean ± S.E.M. All of the actions of varenicline should be taken into account when considering a potential mechanism for smoking cessation. Varenicline is a potent partial agonist at α4β2 receptors, a less potent high efficacy agonist at α3β4 receptors, a partial agonist at α3β2 and α6-containing receptors, and a potent full agonist at α7 receptors. The involvement of presynaptic α4- and α6-containing receptors in regulating dopamine release in the striatum (Salminen et al., 2004), makes the partial agonism of varenicline at these receptors an attractive potential mechanism (Coe et al., 2005a). However, the potent high efficacy activation of α7 receptors may also be important. In addition, because therapeutic use of varenicline involves long-term exposure, it may be that it is the greater affinity of varenicline for the α4β2 receptor in the desensitized state(s) that is important. That is, varenicline may have a selectively greater ability to maintain α4β2 receptors in a desensitized state. Although it is possible that one of these actions is critical, it is also possible that that some combination of these actions might work in concert to achieve a desirable smoking cessation outcome. Regardless of the exact mechanism of action, it is ultimately the results of clinical trials that determine the usefulness of varenicline as a smoking cessation therapeutic. It should also be noted that the potent, high-efficacy agonism of the α7 receptor suggests that varenicline may have utility as a treatment of such disorders as schizophrenia and Alzheimer's disease (Jensen et al., 2005). We thank Floyd Maddox and Ana Mederos for excellent technical assistance. This work was supported by National Institutes of Health grants DA08102, MH66038 (to C.W.L. ), and DA12001 (to F.I.C.). K.B.M. was supported, in part, by National Institutes of Health grant T32-HL07188. ABBREVIATIONS: nAChR, nicotinic acetylcholine receptor; ACh, acetylcholine. 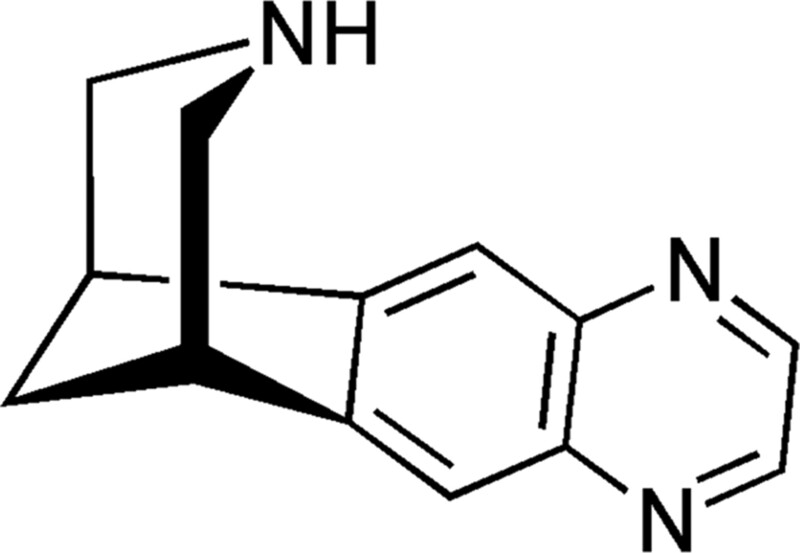 Avalos M, Parker MJ, Maddox FN, Carroll FI, and Luetje CW (2002) Effects of pyridine ring substitutions on affinity, efficacy, and subtype selectivity of neuronal nicotinic receptor agonist epibatidine. J Pharmacol Exp Ther 302: 1246-1252. Azam L, Dowell C, Watkins M, Stitzel JA, Olivera BM, and McIntosh JM (2005) α-conotoxin BuIA, a novel peptide from Conus bullatus, distinguishes among neuronal nicotinic acetylcholine receptors. J Biol Chem 280: 80-87. Brooks PR, Caron S, Coe JW, Ng KK, Singer RA, Vazquez E, Vetelino MG, Watson HH Jr, Whritenour DC, and Wirtz MC (2004) Synthesis of 2,3,4,5-tetrahydro-1,5-methano-1H-3-benzazepine via oxidative cleavage and reductive amination strategies. Synthesis 11: 1755-1758. Carbonnelle E, Sparatore F, Canu-Boido C, Salvagno C, Baldani-Guerra B, Terstappen G, Zwart R, Vijverberg H, Clementi F, and Gotti C (2003) Nitrogen substitution modifies the activity of cytisine on neuronal nicotinic receptor subtypes. Eur J Pharmacol 471: 85-96. Chavez-Noriega LE, Crona JH, Washburn MS, Urrutia A, Elliott KJ, and Johnson EC (1997) Pharmacological characterization of recombinant human neuronal nicotinic acetylcholine receptors hα2β2, hα2β4, hα3β2, hα3β4, hα4β2, hα4β4 and hα7 expressed in Xenopus oocytes. J Pharmacol Exp Ther 280: 346-356. Chavez-Noriega LE, Gillespie A, Stauderman KA, Crona JH, Claeps BO, Elliott KJ, Reid RT, Rao TS, Velicelebi G, Harpold MM, et al. (2000) Characterization of the recombinant human neuronal nicotinic acetylcholine receptors α3β2 and α4β2 stably expressed in HEK293 cells. Neuropharmacology 39: 2543-2560. Coe JW and Brooks PRP (2002), inventors; Pfizer, assignee. Aryl fused azapolycyclic compounds. U.S. patent 6,410,550. 2002 Jun 25. Coe JW, Brooks PR, Vetelino MG, Wirtz MC, Arnold EP, Huang J, Sands SB, Davis TI, Lebel LA, Fox CB, et al. (2005c) Varenicline: an α4β2 nicotinic receptor partial agonist for smoking cessation. J Med Chem 48: 3474-3477. Coe JW, Brooks PR, Wirtz MC, Bashore CG, Bianco KE, Vetelino MG, Arnold EP, Lebel LA, Fox CB, Tingley FD 3rd, et al. (2005b) 3,5-Bicyclic aryl piperidines: a novel class of alpha4beta2 neuronal nicotinic receptor partial agonists for smoking cessation. Bioorg Med Chem Lett 15: 4889-4897. Coe JW, Vetelino MG, Bashore CG, Wirtz MC, Brooks PR, Arnold EP, Lebel LA, Fox CB, Sands SB, Davis TI, et al. (2005a) In pursuit of alpha4beta2 nicotinic receptor partial agonists for smoking cessation: carbon analogs of (-)-cytisine. Bioorg Med Chem Lett 15: 2974-2979. Corringer PJ, Le Novere N, and Changeux JP (2000) Nicotinic receptors at the amino acid level. Annu Rev Pharmacol Toxicol 40: 431-458. Jensen AA, Frolund B, Liljefors T, and Krogsgaard-Larsen P (2005) Neuronal nicotinic acetylcholine receptors: structural revelations, target identifications, and therapeutic inspirations. J Med Chem 48: 4705-4745. Kuryatov A, Olale F, Cooper J, Choi C, and Lindstrom J (2000) Human α6 AChR subtypes: subunit composition, assembly and pharmacological responses. Neuropharmacology 39: 2570-2590. Luetje CW and Patrick J (1991) Both α- and β-subunits contribute to the agonist sensitivity of neuronal nicotinic acetylcholine receptors. J Neurosci 11: 837-845. McIntosh JM, Azam L, Staheli S, Dowell C, Lindstrom JM, Kuryatov A, Garrett JE, Marks MJ, and Whiteaker P (2004) Analogs of α-conotoxin MII are selective for α-containing nicotinic acetylcholine receptors. Mol Pharmacol 65: 944-952. Obach RS, Reed-Hagen AE, Krueger SS, Obach BJ, O'Connell TN, Zandi KS, Miller S, and Coe JW (2006) Metabolism and disposition of varenicline, a selective α4β2 acetylcholine receptor partial agonist, in vivo and in vitro. Drug Metab Dispos 34: 121-130. Papke RL and Heinemann SF (1994) Partial agonist properties of cytisine on neuronal nicotinic receptors containing the b2 subunit. Mol Pharmacol 45: 142-149. Papke RL and Porter Papke JK (2002) Comparative pharmacology of rat and human alpha7 nAChR conducted with net charge analysis. Br J Pharmacol 137: 49-61. Parker MJ, Beck A, and Luetje CW (1998) Neuronal nicotinic receptor β2 and β4 subunits confer large differences in agonist binding affinity. Mol Pharmacol 54: 1132-1139. Salminen O, Murphy KL, McIntosh JM, Drago J, Marks MJ, Collins AC, and Grady SR (2004) Subunit composition and pharmacology of two classes of striatal presynaptic nicotinic acetylcholine receptors mediating dopamine release in mice. Mol Pharmacol 65: 1526-1535. Slater YE, Houlihan LM, Maskell PD, Exley R, Bermudez I, Lukas RJ, Valdivia AC, and Cassels BK (2003) Halogenated cytisine derivatives as agonists at human neuronal nicotinic acetylcholine receptor subtypes. Neuropharmacology 44: 503-515. Stauderman KA, Mahaffy LS, Akong M, Velicelebi G, Chavez-Noriega LE, Crona JH, Johnson EC, Elliott KJ, Gillespie A, Reid RT, et al. (1998) Characterization of human recombinant neuronal nicotinic acetylcholine receptor subunit combinations α2β4, α3β4 and α4β4 stably expressed in HEK293 cells. J Pharmacol Exp Ther 284: 777-789. Xiao Y, Baydyuk M, Wang HP, Davis HE, and Kellar KJ (2004) Pharmacology of the agonist binding sites of rat neuronal nicotinic receptor subtypes expressed in HEK 293 cells. Bioorg Med Chem Lett 14: 1845-1848.